I teach Private, Semi- Private and group swim lessons through the Town of Mount Pleasant. You can contact me to arrange swim lessons, personal training, and rehabilitation sessions. My youngest swim students are parent/tot classes starting at around 6 months old. 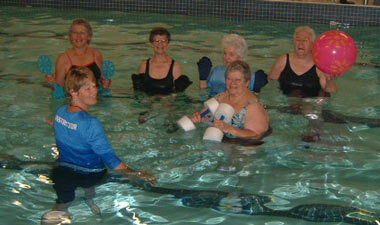 There is no age limit, you are never too old to learn to swim or use the water for training and rehabilitation. Water Fitness Classes - are taught at Dunes West and Palmetto County Park - see below for listing of classes I teach. In addition I offer one-on-one Water Fitness Classes, Personal Training, Aqua Rehab and Arthritis as well, and am qualified to train others to be WaterART Fitness Instructors, contact me if you are interested in becoming an instructor. Palmetto County Park – New this summer!! 2 new session 8 classes each. at Splash Island after it closes when we will be on the water in a peaceful environment HITT the WATER with a high intensity work out. 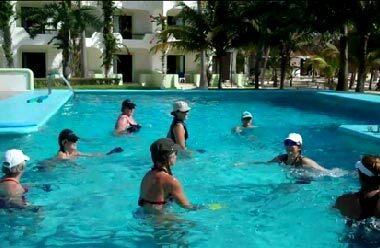 Monday & Wednesday We have a deep water work out which uses noodles and other equipment to maximize the core while protecting the body. 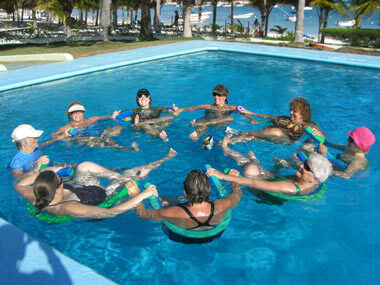 It is fun and very aerobic Tuesday & Thursday We have a shallow work out at the adult only pool. This is more of a muscle building and stretching work out. On Thursdays it is followed by Happy Hour at the pool. Register prior to May 5, 2015 and save. Register prior to August 12, 2015 and save. Contact me if you are interested in setting up a class for your neighborhood pool. © 2017 Just Imagine, Inc.